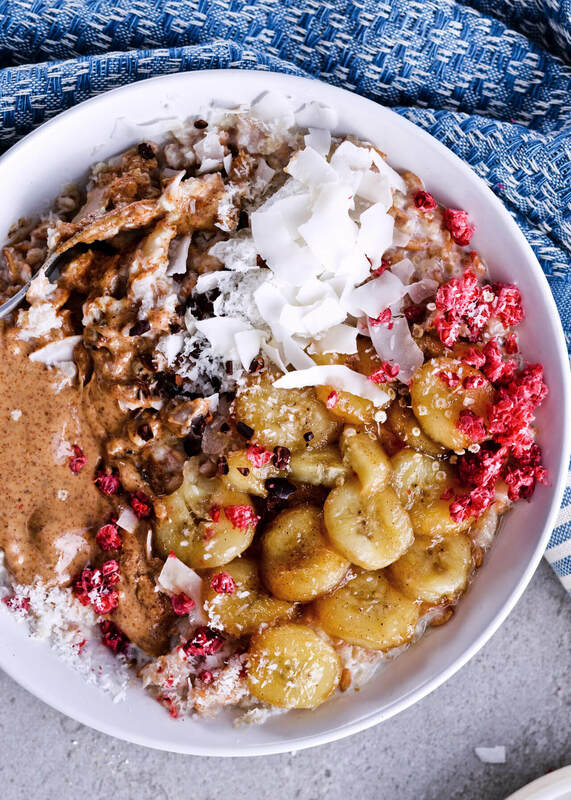 Caramelized banana quinoa spelt oatmeal is anything but your typical oatmeal. We’re in that early Spring stage now, where I sometimes don’t know what to wear, because the afternoons are warm, but the second the sun sets or the clouds come rolling in it’s cold again. It’s a constant dilemma of winter vs. spring clothes, coat on vs. coat off, shoes that can handle rain and shoes that can’t. Which I know, I know... aren’t real problems at all, but I absolutely hate carrying clothes in my hands when I’m out so I prefer to get it right before I walk out the door. But I do still love this season, because I can still be somewhat bundled up and I can still wear coats and unlike in the summer, I still love to cook oatmeal in the mornings. You all now by now that I am a moody eater and what I normally eat is so related to the weather. 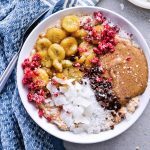 It’s grey and windy out right now, so I thought this would be the perfect time for me to share this Caramelized banana quinoa spelt oatmeal with you guys. It is my latest breakfast obsession and the recipe, while easy, is just too good to pass up. Because sometimes it’s nice to have a warm breakfast, isn’t it? 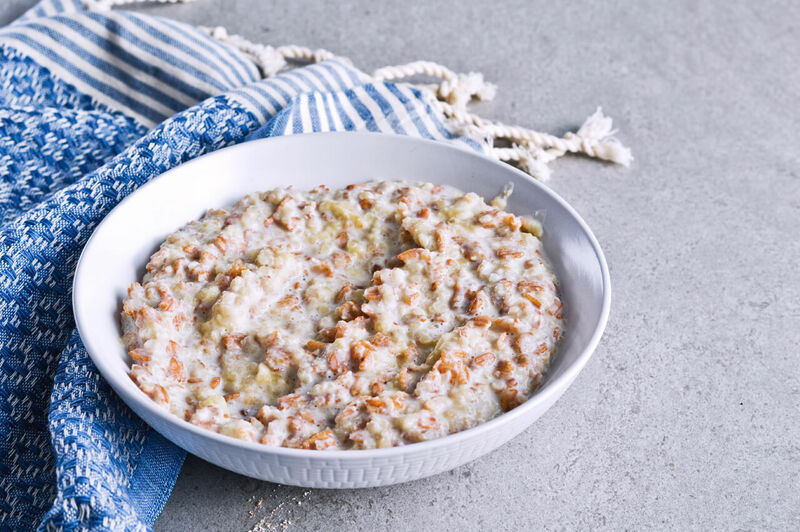 As you’ve seen from the name of the recipe, this oatmeal isn’t your classic oatmeal but it’s not really different either. Instead of old-fashioned oats, I’m using spelt flakes, which look just like classic oats and are no different to cook with. And then I mixed some quinoa flakes in there as well, which are completely optional. They’re smaller and cook faster and I feel they add some creaminess to the oatmeal. Another thing that adds great flavor and texture to oatmeal is a mashed banana. Of coursed if you’re not a fan of the flavor, then you should probably skip it, but I love bananas. I normally have one for breakfast everyday anyway, but I went all out with this oatmeal and added both a mashed banana and caramelized bananas to it! The mashed banana cooks together with the oatmeal and really develops that rich, almost rum-like aroma as it cooks. That alone makes the oatmeal really flavorful, but as mentioned I added caramelized bananas on top too. They’re done so quickly, it really takes no extra effort, especially when you’re making such a small batch. A classic combination for caramelizing would be butter + sugar, instead I really like the combination of coconut oil and maple syrup. The coconut oil has such a nice, light aroma and the maple syrup has just the right amount of sweetness. I find that honey can be too sweet, so maple syrup is my current choice for a sweetener that isn’t classic sugar. 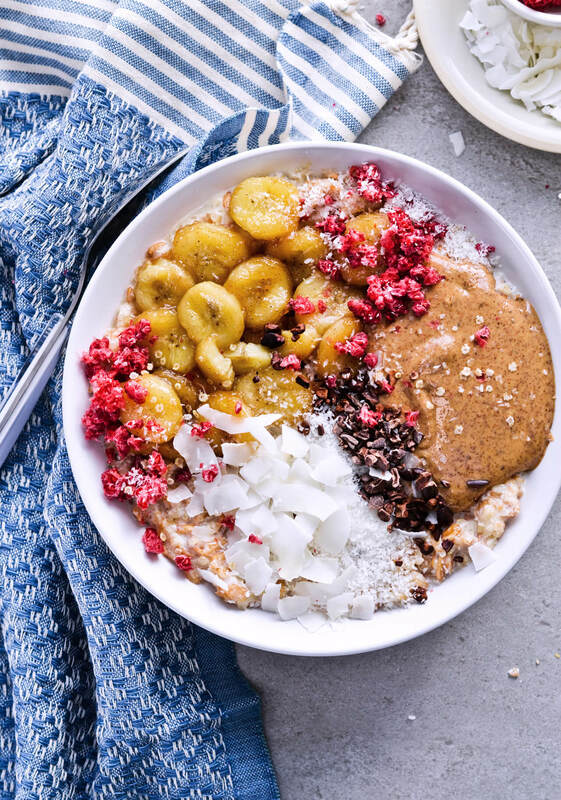 Now, you can stop doing everything at this point as this caramelized banana quinoa spelt oatmeal is already really tasty, but I like to go crazy with the toppings sometimes. I love the addition of almond butter and shredded coconut, because they just add amazing flavor to the oatmeal and I never have oatmeal without. And then there are other toppings like cocoa nibs and dried raspberries which make the oatmeal even more perfect. If you add cocoa nibs you’re basically having chocolate for breakfast, but just a small healthy portion. The dried raspberries aren’t only pretty, they also help make the whole meal more versatile as their flavor is a complete opposite of the hearty banana-coconut-cocoa combination. They’re fresher and add that natural raspberry sour flavor that we all know and love. 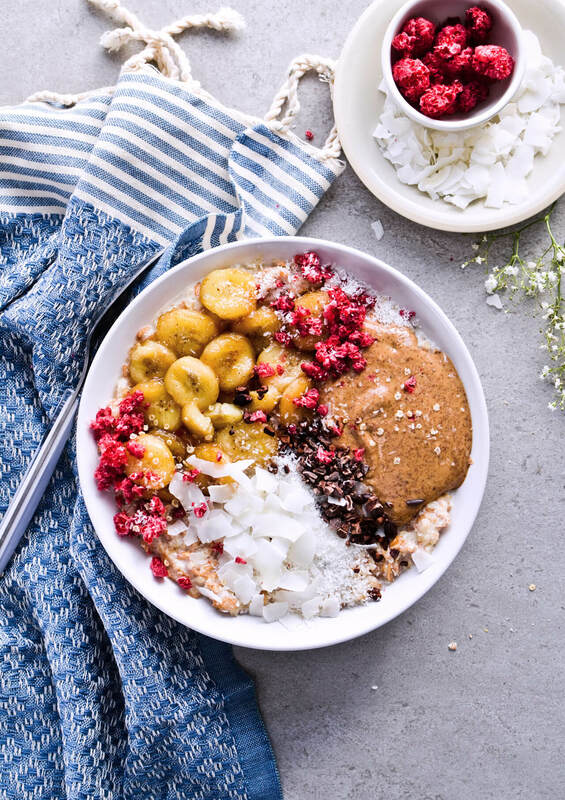 So basically what I’m trying to say is that on those days, when you can find a few extra minutes in the morning, you really need to make this caramelized banana quinoa spelt oatmeal. It’s so hearty and bursting with flavor that you’ll just want more and more of it. And it’ll fill you up for hours, without being heavy, which to me makes the perfect breakfast. A cozy and flavorful breakfast! Serves 1 comfortably; can be divided into 2 portions. Combine spelt and quinoa flakes, milk, salt, maple syrup and 1/2 banana in a small saucepan. Cook over medium heat, stirring occasionally, for about 15 minutes or until the flakes are tender and the oatmeal creamy. (The longer you cook after that, the thicker it’ll get). Remove from heat and transfer to a bowl. Heat oil in a small pan set over medium heat. Stir in maple syrup, cinnamon and vanilla paste. Once the mixture starts to bubble, add bananas and simmer them on each side for about 2 minutes, or until they’re soft and golden. Remove from heat. 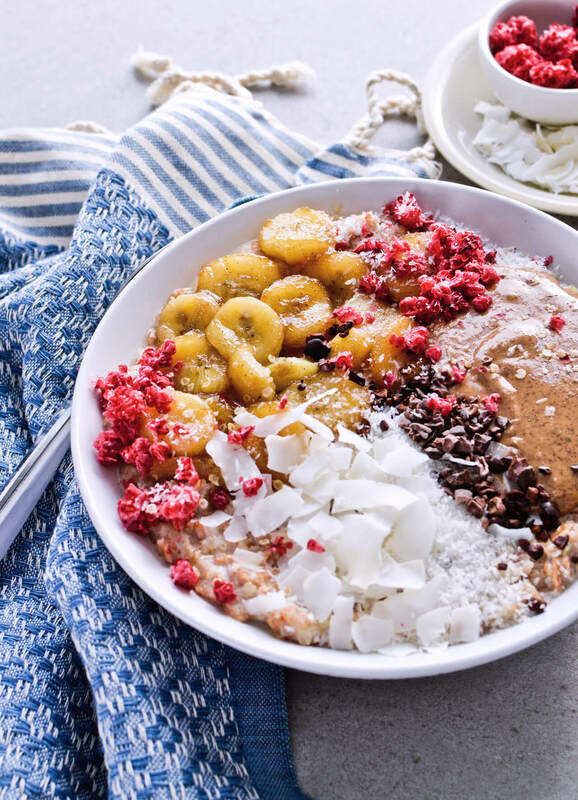 Add bananas to the bowl of oatmeal, then top with desired toppings and… eat and enjoy! 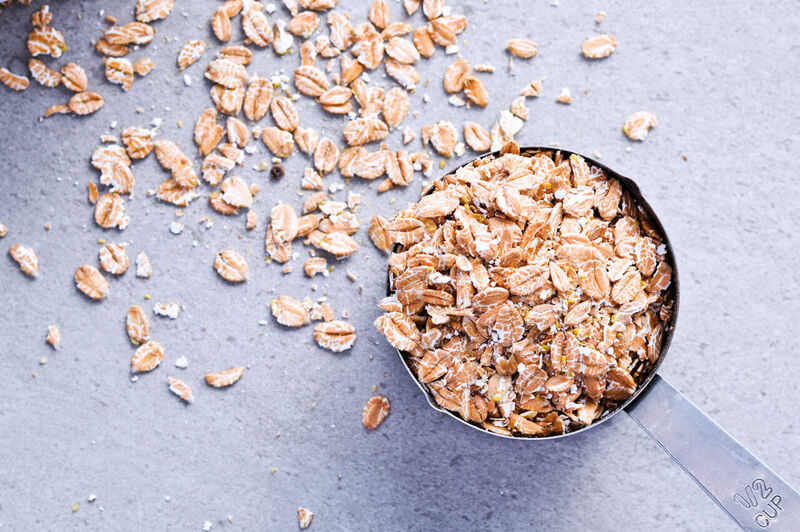 If you can’t find spelt and/or quinoa flakes, classic rolled oats work just as well. Your photography is just beautiful! I love the grainy quality of pictures–it’s got a very cool cozy, vintage thing going on. I love caramelized bananas, so I’m sure this recipe is delicious.